Not unlike traveling to Japan itself, this past weekend's J-Pop Summit,which combines food, culture, technology and popular music from Japan. delivered a complete sensory overload that made for one of the most immersive experiences this side of virtual reality. It's hard to know where to begin to describe it as words and pictures only scratch the surface. 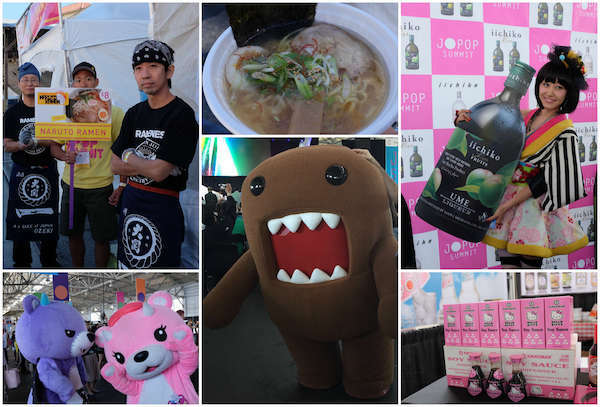 But, for me, the Ramen Summit with 8 booths serving their own take on this foodie favorite was a major draw. The ramen on offer here came in so many different styles that it was tough deciding but I went with a bowl of ramen from a very sucessful ramen shop with 3 locations in Tokyo that will soon be is opening up in Japantown. Hinodeya is the winner of the Japan Ramen Awards for 2016 and after tasting their ramen, I can see why. The dashi broth was much lighter but at the same time very rich. The egg noodles were wider and wavier than other ramen but still al dente. The slice of pork and cooked egg were tender and delicious. I'm looking forward to the opening of their shop! In addition to the ramen there was a booth offering takayaki, a kind of savory octopus donut and sushiwich, a kind of sushi in the form of sandwich. Off the beaten path but well worth seeking it out, were delicious cups of udon noodles with spicy codfish roe. There was sake, beer, award-winning shochu and low alcohol peach and grapefruit flavored cocktails to try. I’m not going to tell you all about the technology (this is a food blog after all)—but it was great to have so much that was interactive and not just on display. It seemed in keeping with the playful and hands-on nature of the festival. Likewise the virtual tour of Japan in the tourism area had to be experienced, but I did walk away with packets of bath salts made to resemble ramen soup(!) and plenty of brochures about less known regions of Japan. I'm sorry to say I missed some of the music and the drag queen contest, though I did see some of the contestants. Perhaps best of all was the music and kookiness that is Japanese culture. If you don’t know what I mean you’ll just have to check out this video. Domo, Domo, Domo!